The following is a partner post  from EurasiaNet.org  written by Almaz Kumenov . Republished with permission. Kazakhstan has reportedly adopted online software developed by Russia's security services and designed to detect protest moods among the population. 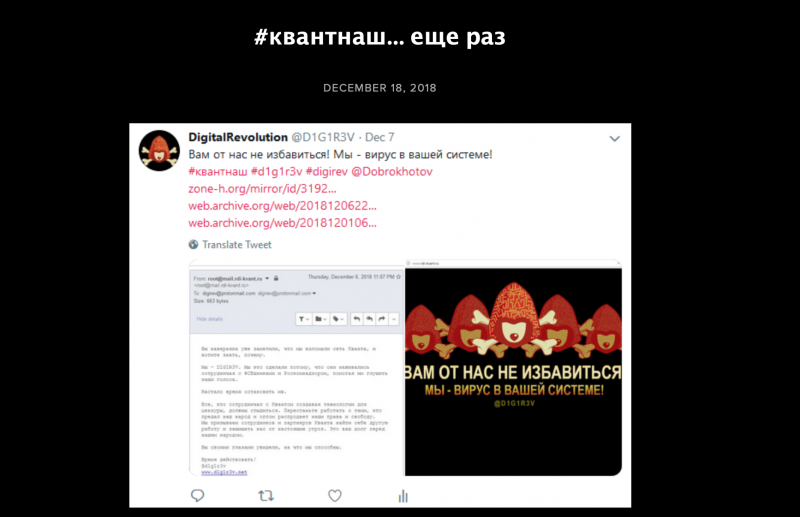 Russia-based hacking collective Digital Revolution on December 19 posted  scanned documents on its website that it claimed were proof of a mechanism that systematically trawls online news resources and social media for evidence of public discontent. The hackers say that they unearthed the documents by cracking into the servers of the Kvant Scientific Research Institute, a unit inside Moscow’s Federal Security Services, or FSB. According to the leaked documents, Kvant uses artificial neural networks to analyze activity on Facebook and Instagram, and Russian analogues VKontakte and Odnoklassniki, to detect key phrases potentially signaling political discontent. According to a BBC Russian report , Kvant was a research unit that was responsible for producing the first Soviet computers in the 1970s. Earlier this year, the U.S. Treasury Department identified  Kvant as an agency engaged in attempting to destabilize the United States. In the same statement, Treasury states that in 2010 Kvant was designated a federal state unitary enterprise under the aegis of the FSB. BBC Russian is now reporting  that Kazakhstan appears to have developed a system similar to what Russia has in place. In January, the Information and Communications Ministry revealed  it had allocated around $5 million for the creation of an automated system for monitoring the information space. The ministry said its aim was to curb incitements to terrorism, extremism and suicide. The developer was to be chosen by means of a state tender and the work on the project was to be completed by the end of 2018. BBC Russian reports that it has found no government documentation attesting to procurement of the required equipment. But some tracks have instead been detected by Digital Revolution. According to a document uploaded by the hacking collective, just such a system was devised for Kazakhstan in Moscow in 2017. Confusingly, the contractor on this operation was a Kazakhstan-based research outfit also called Kvant, while the subcontractor was the Moscow-based Kvant. The apparently privately held Kvant in Astana states on its website  that it has been analyzing big data since 2015 and that it provides services to several international IT companies. Kvant owner Lyazzat Shakimova confirmed to BBC Russian that her company was working on a monitoring system, but denied it had any contact with the Russian Kvant. The Information and Communications Ministry has not commented publicly on the BBC Russian report. Restrictive government control over online space in Kazakhstan has had real-life consequences  for countless internet users. Many grumble that speeds slow down almost every evening in what is suspected to be an attempt by the government to limit access  to live content produced by a hated opposition figure in exile. Also, prosecutors have made an example of several people deemed to be using online resources like Facebook to express their discontent with how the country is being run. At the end of November, a court in Almaty sentenced  a man to four years in jail after he was found to have provided “information support” to a now-proscribed opposition group, the Democratic Choice of Kazakhstan. Warsaw-based Open Dialogue Foundation recently identified  the defendant in that case as being one among some 30 people in Kazakhstan that had been targeted with legal procedures between March and October 2018 in reprisal for critical postings on social media or in messaging apps.